Should Middle Powers Integrate or Go it Alone? Middle powers have an interesting choice when it comes to procurement policies. Robert Farley explains. How does coalition-building affect procurement? To what extent do (or should) states anticipate operating in a multilateral environment, and choose their weapons accordingly? A recent FlightGlobal article examined Canadian military procurement policies, especially with regard to plans to replace the Royal Canadian Air Force’s CF-18 fleet with F-35 Joint Strike Fighters. The F-35 purchase has generated a great deal of controversy because of the heavy price tag and the contracting process. Much of the debate turns on how Canada expects to become involved in foreign conflicts, and consequently on what tasks are required from Canadian military forces. The process sheds light on how Canada, a state which has long conceived of its security interests as being embedded with the United States and the United Kingdom, thinks about the design of its military institutions. The question of integration with foreign partners has long bedeviled aspects of Canadian defense policy; the disconnect between Canadian civilians and military commanders during the Cuban Missile Crisis played a role in the eventual decision to unify the Canadian armed forces. Because the services were intimately tied to their counterparts in the UK and the United States, Canada ran the risk of going to war without sufficient civilian deliberation. Canada’s dilemma in this regard is hardly unique. The broader question involves the degree to which military procurement policies will be guided by expectations of integration into a multi-lateral military framework. Middle powers have a choice between procurement policies that maximize their unilateral security, and policies that maximize their ability to contribute to multilateral operations. For example, the United Kingdom faces a choice between preserving its nuclear deterrent (at this point a fundamentally unilateral project), and maintaining viable conventional forces capable of operating at the sharp point of NATO. For what it’s worth, the choice the United Kingdom faces seems to be an easy one, with (nuclear armed) irrelevance on one hand and non-nuclear but conventionally potent forces on the other. Canada’s choice is obviously more complicated, but it is difficult to imagine a strategic situation demanding that the Royal Canadian Air Force spearhead a prolonged air campaign against a modern air defense system. Following the defeat of an enemy air defense system, RCAF CF-18s (or Typhoons, or Rafales) can make Canada’s contribution in a far more cost effective manner than Joint Strike Fighters, the F-35’s stealth notwithstanding. 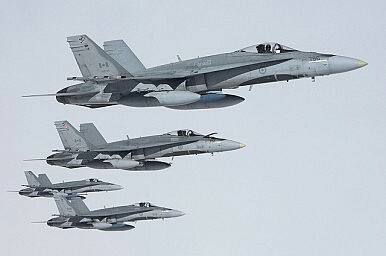 Given that the U.S. Navy may continue to purchase F-18s, it’s less than clear that Canada will be left behind by a decision to forego the F-35 purchase. In contrast to the Atlantic, the Asia-Pacific lacks this degree of military integration, although proposals for such joint ventures as ASEAN military exercises may point the direction toward greater integration in the future. As Andy Thomchick recently argued, the Philippines procurement policies may increasingly make military integration with the United States a given. But even between South Korea and Japan, tensions and strategic disagreements prevent coordination of security policy from reaching deep enough to touch procurement, although in some sense both Korean and Japanese procurement is complementary with that of the United States. Meanwhile AirSea Battle remains a tough sell even in states as friendly as Australia. Thus, the United States can to some extent provide a focal point for procurement decisions across the Asia-Pacific, at least to the extent that states see their interests as aligning with those of the U.S. But Washington shouldn’t expect that Japan, Australia, the Philippines or the RoK will ever become as embedded in a U.S. led security community as Canada currently is, even though all of them should nonetheless pay close attention to how their procurement policies can address gaps in U.S. capability. They should also identify areas in which their strategic interests do not coincide with that of the United States or other neighbors, and determine what assets are fundamentally unilateral in nature and which operate best in a multilateral context. F-35 Brains in an F-22 Body: Thinking Through Japan's Next-Generation Fighter OptionsWhat Does the Latest F-35 Data Breach Teach Us About Defense Industrial Espionage?Room for Maneuver in Australia's Naval Aviation Plans? 'Optionality' and the Future of US Defense ProcurementIs This What the Pentagon's 'Third Offset' Has Been Missing All Along?